The former Defence Minister cut a cake at the party office in the presence of his son, grandchildren, and senior party leaders Kiranmoy Nanda and Bhagwati Singh. 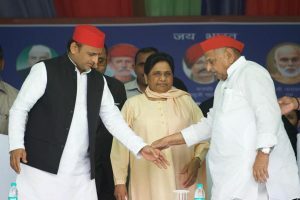 Akhilesh Yadav, who in a coup of sorts dethroned his father as party chief in December 2016 after a bitter feud within the Yadav clan and party, shared the celebration pictures on his official Twitter account, hailing his father as a leader who had shown his supporters and followers the path of truthfulness and non-violence. The party office at the Vikramaditya Marg here was decked up, with posters and hoardings carrying pictures of Mulayam and Akhilesh dotting the entire stretch. Another celebration to mark the day is being organised by Mulayam’s younger brother Shivpal Singh Yadav. He has organised a grand ‘dangal’ (wrestling competition) at Saifai, their native village. His newly-launched party, the Pragatisheel Samajwadi Party (PSP), is also holding several events across the state to mark Mulayam’s birthday. The PSP has termed it as ‘Secularism Day’. 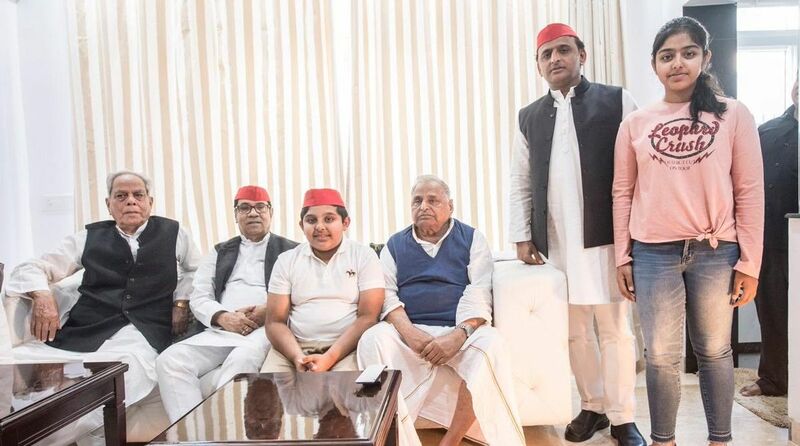 The party, which Mulayam formed 25 years ago, has split between Akhilesh and Shivpal Singh Yadav, with the family patriarch vacillating between his son and younger brother in his support for them.